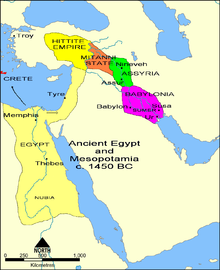 Map showing the Assyrian Empire at its greatest extension (7th century BC). ↑ Encyclopaedia Britannica "The state was finally destroyed by a Chaldean-Median coalition in 612–609 bce." Ascalone, Enrico (2007): Mesopotamia: Assyrians, Sumerians, Babylonians (Dictionaries of Civilizations; 1). Berkeley: University of California Press (paperback, আইএসবিএন ০-৫২০-২৫২৬৬-৭). Grayson, Albert Kirk (1975): Assyrian and Babylonian Chronicles (ABC), Locust Valley, N.Y., Augustin; reed. Winona Lake, Eisenbrauns (2000). Leick, Gwendolyn (2002): Mesopotamia: The Invention of the City. Penguin Books. Nardo, Don (1998): The Assyrian Empire. San Diego. Olmstead, A. T. (1923): History of Assyria, Chicago. Oppenheim, A. Leo (1964): Ancient Mesopotamia: Portrait of a Dead Civilization. Chicago. Roux, Georges (1964): Ancient Iraq. 1st ed., 3rd ed., London, Penguin Books, 1992 (paperback, আইএসবিএন ০-১৪-০১২৫২৩-X). Van de Mieroop, Mark (2004): A History of the Ancient Near East, Oxford.